Sports car styling with sculpted arm design. Heavy-duty base detailed with grooves and contours for both style and stability. 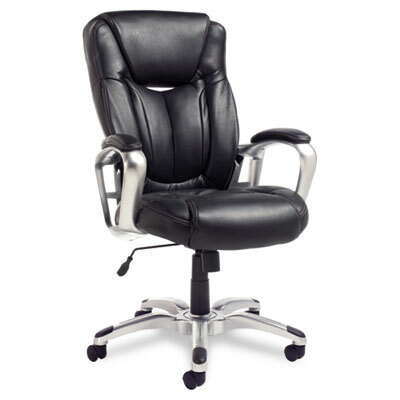 Ergonomic comfort features include ultrasoft cushioning, side bolsters and pronounced lumbar. The opening at bottom of headrest promotes air circulation to upper back and neck. Soft touch leather and eco foam make this an all-around feel good chair. Black foot zones on aluminum base provide scratch resistance. Quick and easy no-tools, no-hardware assembly. Sports car styling with sculpted arm design. Heavy-duty base detailed with grooves and contours for both style and stability. Ergonomic features of ultrasoft cushioning, side bolsters and pronounced lumbar give you ultimate comfort. The opening at bottom of headrest promotes air circulation to upper back and neck. Soft touch leather with eco foam make this an all-around feel good chair. Black foot zones on aluminum base help prevent scratches. Quick and easy no-tools, no-hardware assembly.